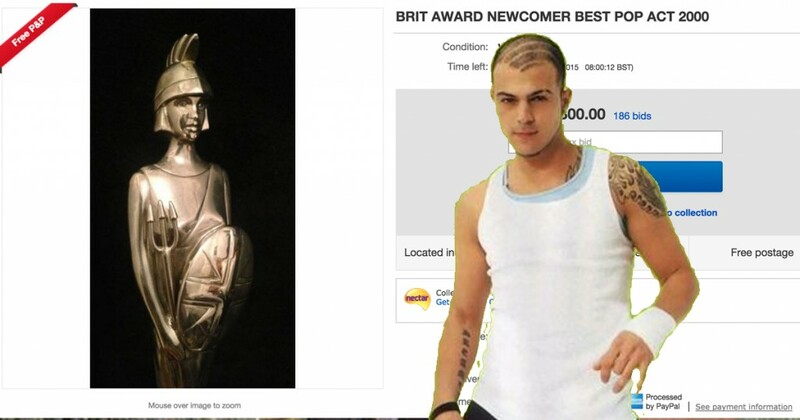 So to raise a bit of money the singer has put the Brit Award he won for best pop act with Five in 2000 up for auction on Ebay. He goes on to write – ‘It has been ‘dropped and knocked’ and it’s ‘currently being used as a door stop’. Come on Abz. Show some respect! The rapper continued: “Good condition, light scratching (to be expected for age), one previous owner from new. “Selling to fund a delivery of topsoil and maybe some garden tools. Has been dropped and knocked a few times and is currently being used as a door stop. The bid currently stands at a whopping £1,000,300.00 however something tells me some of the bids are not genuine. Even Ebay have Tweeted about it to help Abz out.